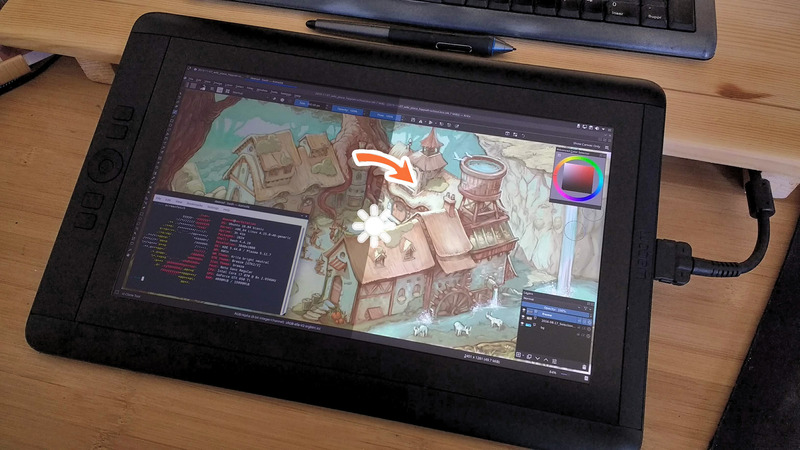 Last month, during a discussion on Twitter with the GNU/Linux artist Tyson Tan, Neotheta and Wacom Official, I started to talk about the impossibility for GNU/Linux users to setup the brightness/contrast/RGB on their Cintiqs. And during this discussion Jason Gerecke -maintainer of the Linuxwacom driver- wrote a solution to this issue. Today, I'm reporting this solution on this article for better archiving and in the hope it will help future GNU/Linux artists at finding a solution to their problem. Cintiqs are tablets made by Wacom with a display monitor built inside the surface of the pen tablet. In my carreer, I owned four Cintiqs. If you want to read my opinions about this tablets, read my full tablet history log article here. On the older models, the monitor had physical buttons to setup the brightness/contrast/RGB, something similar to many common monitors on the market. But around 2010, Wacom replaced the buttons by a driver (a software available only for Windows and Mac). That's why I never could manage to change the brightness and the contrast of my hardware. I had to use the default factory setting but this one was unfortunately too dark by default. Thanks to this two commands, you can list and get the identifier of the detected hardware by ddcutil. Unfortunately this two commands crashes my computer and freeze the display. I have to hard reboot holding the power button six seconds each time I'm using them. But the display freeze after printing the result on the screen and you'll have to run this commands only once to know your identifier. In my case, my Cintiq has a three letter capitalized identifier: WAC. 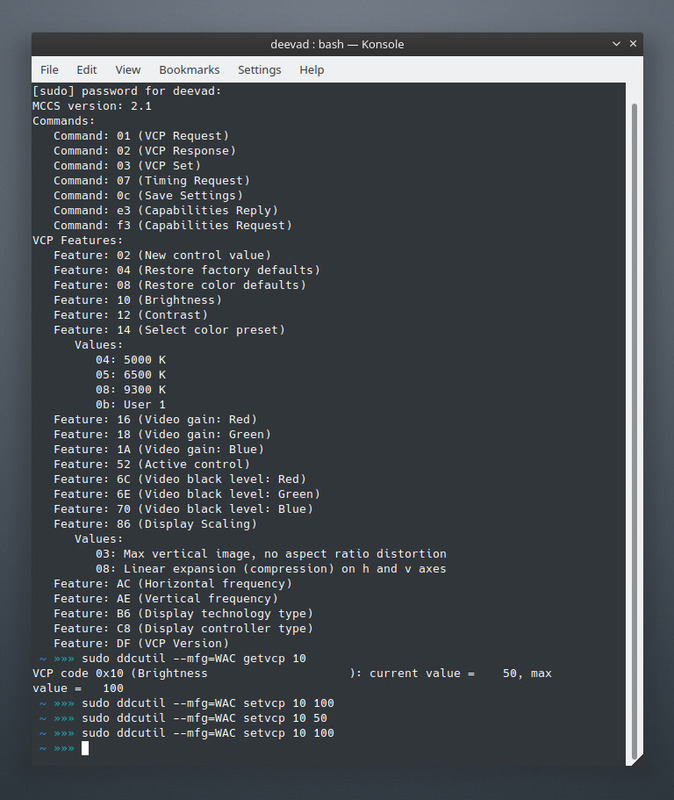 This command will list all the capabilities of the 'WAC' device (screenshot under). Each capabilities are identified by a number (eg. Brightness is number 10). Screenshot: Konsole, listing the capabilities of my Cintiq13HD. Thanks to this control on the brightness/contrast/RGB of my Cintiq, I was able to match the same luminous intensity in cd/m² as my other monitors. I was also finally able to calibrate the Cintiq to sync with the colors of my other monitors. I also discovered it was possible to draw on this device during the day without having to close the windows and set my workplace into the dark. It was long, tedious to setup this device via the command line but it was possible. This totally made me focus back on digital drawing using this hardware. Thank you again Jason Gerecke for sharing this solution and obviously not thank you Wacom for publishing only drivers for Mac and Windows on your website. This story is just another proof that being an artist on GNU/Linux requires a lot of knowledge... or you might spend years of your life painting in the darkness (as I did). License: CC-BY David Revoy, www.davidrevoy.com, 29 march 2019 . For hard reboot, I prefer prefer using the magic SysRq key (https://en.wikipedia.org/wiki/Magic_SysRq_key) in a sequence of shortcuts Alt-SysRq-S (to sync filesystems), Alt-SysRq-U (to remount them as read-only) and Alt-SysRq-B (to actually force immediate hard reboot). Oh, I haven't thought of using that for the monitor on my laptop. That sounds so obvious now. I'll try. Thank you for the tip! I use redshift on my stumpwm WM debian manager. @cybertron: Redshift doesn't manage this type of brightness at a hardware level. As far as I know, it interacts only with the color curve of the output of the graphic card: so you can't brighten an hardware or use the feature of the monitor; you can just 'tone down' the video signal output. Solutions like redshift might solves very well the blue color issue that affect human's sleep cycle but unfortunately for graphist/artist, I never saw a solution like that mixing well with the need of keeping a consistent color-profiling and calibration. I would like to know if the dev of graphic server thought about this. It connects only by HDMI or needs also a connection USB? @bazza: The Cintiq13HD has a all-in-one single cable (you can see on the photo) that split into a HDMI, a USB and an alim (requiring 220volts here). So it is really like a monitor plus a tablet hardware. The USB manages the Wacom tablet, the monitor is managed by HDMI. You can even disconnect the USB and use only the 1080p monitor. Finally a way! Thank you so much for sharing! ''Hi David, How long dose it take for you to complete a complete page, just for sketching, coloring and editing'' ... For your comic book. It is too hard to tell; because I'm not doing page from A to Z one by one like artworks. I do cycle: a pass on all pages for storyboard, then for pencil, then for line-art, then color-flat, then background painting, then shading, then paint-over and then post-FX. It does loops in the agenda. Also, I'm not doing only production: I experiment, I record video tutorials, I do video-editing cut, I write articles, I interact with community, I maintain the translations and website. So, right now I take in between two month and three month to complete a 8 pages long episode. That's a bit more than a full week per page? Maybe around 30h of pure production per page. WOW, thanks for the reply and rely appreciate your dedication to your work.